Ohma-D'un was the largest of the three moons orbiting around Naboo. It is known to the Gungans and Humans as the water moon as it is mostly covered in swamps and lakes. It is a lush moon covered in plants because of all the water, but it can take a while to get used to the smell of the swamps. It has no native species but Gungans did colonize this moon shortly after the Battle of Naboo. Spice mines were also set up on Ohma-D'un by Humans. The Gungans first came to this moon as an attempt to make there home world less crowded, they succeeded and created New Otoh Gunga. Durge and Asajj Ventress tested a new chemical weapon—Jenna Zan Arbor's swamp gas—on the Gungan inhabitants of Naboo's moon, Ohma-D'un. The toxin turned out to be very effective, particularly against Gungans, who died shortly after being exposed to the gas. Upon learning this, the two started making preparations for a full-scale swamp gas attack on Naboo itself. The Battle of Ohma-D'un took place roughly ten weeks after the Battle of Geonosis. When the planet Naboo lost contact with a Gungan colony on the moon of Ohma-D'un, the Republic sent a squad of four Jedi to investigate. This team consisted of Obi-Wan Kenobi, Anakin Skywalker, Master Glaive, and Zule Xiss. To stay unnoticed, the team flew to the moon in a single gunship. They quickly found what had become of the Gungan colony. Every single Gungan had died of a mysterious virus. The Jedi team was soon infected by the virus, but luckily its effects took longer to work on non Gungans. 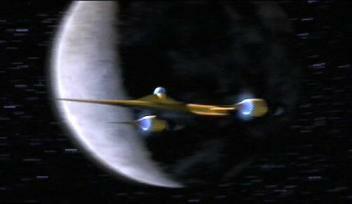 The Jedi soon encountered B-2 Battle Droids and the bounty hunter Durge, attacked them. The Clone troopers were all killed by Durge except for the single ARC Trooper Alpha-17 on the mission. During the Jedi's duel with Durge, he mentioned Gungan prisoners, and Obi-Wan sent Anakin and Alpha-17 to free them. After that, Glaive was caught off guard, and was decapitated by the Separatist commander, Asajj Ventress. She then dueled with Obi-Wan. Meanwhile, Anakin and Alpha-17 successfully freed the Gungan prisoners, and destroyed the capsules of the virus that they were being loaded onto ships destined for Naboo. They then went back to Obi-Wan, and helped him defeat Ventress. However, the evil duo managed to escape, though Naboo was safe.